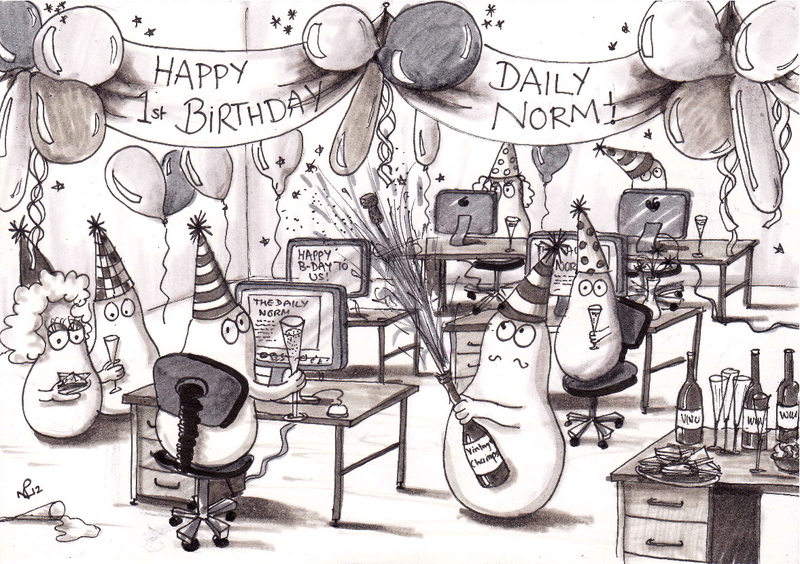 Happy First Birthday to The Daily Norm!! Where has a year gone? When I sat down to write my first ever article for The Daily Norm one year ago today, I typed my first words with trepidation. I had chosen my wordpress theme, uploaded some artwork, and now wondered 1) what on earth I would write about and 2) whether people would be interested in what I had to say. One year later, and with 240 posts written, liked and responded to, with 180,099 total views and counting, and with some 510 current followers, I have to wonder why I was so scared. My initial misgivings soon turned to passion, as I caught the blogging bug big time. Thanks to my blog, I see the world through new eyes – I see the polish and shine in everyday monotony, I appreciate the finer details of an exhibition or a show, I take greater note of names and situations, and I paint and photograph as though my very legacy depended on it. I no longer walk away from an event thinking – what a good show. Now I think – I can’t wait to write about this on my blog. My attitude has changed from solitary satisfaction, to a passion for sharing. I believe it’s worth writing a good post, even if one other person reads it – even if none do at all – for the process of writing about an experience, recalling the light and shade of an occasion, and immortalising an event in words and pictures gives the writer, to my mind, a tremendous sense of satisfaction. It makes you appreciate your life, encourages you to pack every hour with new and worthwhile activities, it installs a fantastic discipline of review and reflection, and it enables small experiences, which may be commonplace in one part of the world, to be shared across the globe. The Norms (my little white blobs, who were of course the source of and inspiration for this blog) and I would like to thank you all so much for your support, for your readership and for your comments over the last year. We want to thank my dear friend Cassandra who, if she is reading, knows only too well that it was she who suggested I start a blog at that time when I was so down in my life. And we would also like to thank all of those who have kindly nominated the blog for a variety of awards including the “Blog on Fire Award”, the “HUG award” (Hope Uniting Globally), the “Very Inspiring Blogger Award” and the “Versatile Blogger Award”. Your support makes me want to go on blogging, and for that I am truly grateful. Here’s to another year of the Daily Norm! Happy 1st Birthday! I look forward to many more years reading posts about Norms, your paintings, photography and anything else. Thank you Cassandra for convincing Nicholas to share his God given talent with the world. Thank you so much! I will pass on your thanks to Cassandra – I know I will be indebted to her for ever! Happy Birthday and many, many more! Thank you for sharing your wonderful work and writings! Thank you!! If you were my neighbour, I’d insist you bake up one of your incredible cakes for the occasion! !